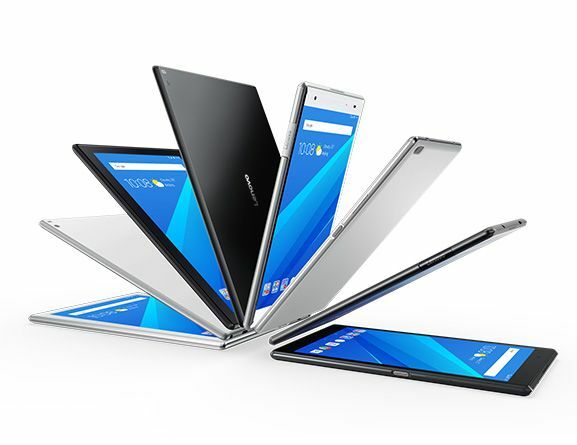 The company Lenovo has released four new Android-tablet within the line of Tab 4. All of them are running the version of Android 7 Nougat. Tablet Lenovo Tab 4 10 Plus is equipped with a 10.1-inch display with a WUXGA resolution of 1920×1200 pixels and an 8-core Qualcomm Snapdragon 625 processor with an Adreno 506 GPU. The memory capacity can be up to 4 GB, and the capacity of the built-in storage is up to 64 GB. On the rear panel is an 8-megapixel camera, and the camera on the front panel is equipped with a 5-megapixel sensor. On the front panel are also located two speakers with support for Dolby Atmos. The novelty carries on board a USB-C port, a fingerprint scanner and a 7000 mAh battery. The price of the starting configuration is $ 279. Model Lenovo Tab 4 10 also contains a 10.1-inch display, but in this case, a panel with a resolution of 1280×800 pixels. The device uses a 4-core Qualcomm Snapdragon 425. The amount of RAM is 2 GB, the capacity of the built-in storage is 16 GB. The camera on the rear panel has an 8-megapixel sensor, and on the front panel is a camera with a 5-megapixel matrix. The device lost its fingerprint scanner. The price of this version is not specified yet. Tablet Lenovo Tab 4 8 Plus is a reduced version of the device Lenovo Tab 4 10 Plus. It also contains a Qualcomm Snapdragon 625 processor, up to 4 GB of RAM and up to 64 GB of internal flash memory. But the display diagonal is 8 inches with a WUXGA resolution of 1920×1200 pixels. The cameras are also equipped with 8- and 5-megapixel sensors. The battery has a capacity of 4850 mAh. The novelty uses a fingerprint scanner integrated into the Home button. The price of the tablet Lenovo Tab 4 8 Plus has not yet been reported. The Lenovo Tab 4 8 version results from the reduction and simplification of the Lenovo Tab 4 10 model. In this novelty, instead of a 10-inch display, an 8-inch panel with the same resolution of 1280×800 pixels is used. The device partially inherits the characteristics of the Lenovo Tab 4 8 version and contains a Qualcomm Snapdragon 425 processor, 2 GB of RAM and 16 GB of internal flash memory. But the configuration of the cameras is different. In this case, users are asked to settle for a 5-megapixel camera on the rear panel and a 2-megapixel camera on the front panel. The price of this version has not yet been disclosed.